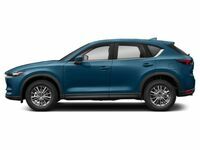 The 2019 Mazda CX-5 is here and though the looks are the same, it features tons of improvements including a new engine option, new tech, and more. 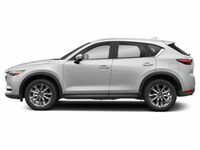 Try a 2019 Mazda CX-5 in Fond du Lac, WI at Holiday Mazda near Beaver Dam, Slinger, and Oshkosh. We are Worth the trip! The Future of the Crossover is Now. It was exciting when the Mazda CX-9 debuted with the Grand Touring Reserve and Signature trims. The Mazda6 followed the trend in 2018. Turns out the Mazda CX-5 isn’t that far behind. For 2019, the Mazda CX-5 will be getting both a Grand Touring Reserve and a Signature trim to add to the Sport, Touring, and Grand Touring that are already in the lineup. They also come with a lot of great features. 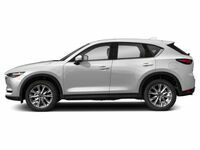 For 2019, the Mazda CX-5 still has the 2.5-liter engine standard with 187 horsepower and 186 pound-feet of torque, but the Grand Touring Reserve and the Signature trims have a turbo surprise. In the new trims, you get a 2.5-liter turbo engine that can deliver up to 250 horsepower and 310 pound-feet of torque. These engines still come with the smooth 6-speed automatic as well as sport mode. In front-wheel drive, the standard non-turbo engine gives you 25-city and 31-highway mpg, and in AWD that same engine still gives you 24-city and 30-highway mpg. For its power, the turbo engine option is still surprisingly efficient with 22-city mpg and 27-highway mpg in AWD. These amazing numbers are all due to the standard Mazda SKYACTIV® TECHNOLOGY. All-wheel drive is a wonderful feature, especially when you have to endure the Wisconsin winters with all their snow, ice, slush, and unpredictability. The Mazda CX-5 gives you the AWD options that you need. In fact, not only is AWD available on every trim, on the new Grand Touring Reserve and Signature trims it comes standard. Many of our options at Holiday Mazda are AWD. Find yours today! The Mazda CX-5 is like a vehicle from the future with tons of driving technology designed to make driving easier, more fun, and safer. Standard you get smart city brake support, blind spot monitoring, hill launch assist, and more. On higher trims, you also get other options like automatic rain-sensing wipers, an auto-dimming rearview mirror, adaptive front lighting, and even radar cruise control. Along with all that driving tech, the 2019 Mazda CX-5 also has a feature-packed standard Mazda CONNECT infotainment system. The infotainment system measures 7 inches and on the Touring and above it features full support for Android Auto and Apple CarPlay. It also has available navigation, SiriusXM satellite radio and even SiriusXM Travel Link Services.